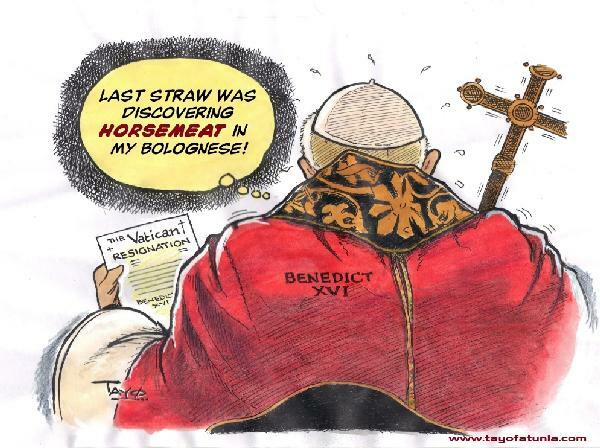 *9) Pope Benedict XVI steps down after nearly eight years as head of the Catholic Church at the same time when products sold as beef were found to contain horse meat across Europe. His decision to step down as leader of the Catholic church made him the first pope to relinquish the office since Pope Gregory XII in 1415. The Pope stated that the reason for his decision was his declining health due to old age. His successor Pope Francis began on 12 March. TAYO Fatunla is an award winning Nigerian Comic Artist and illustrator, Writer, Cartoon Tutor and Editorial cartoonist. He is also a contributor to EURweb.com. Visit TAYO’s web: www.tayofatunla.com.